My Bugs doesn’t look like a rabbit; he looks like Bugs Bunny. I have often told eager students that the easiest way to draw him is probably to draw a carrot and then hook a rabbit onto it. However, I usually begin a drawing of Bugs with the tiny triangle that passes as the nose. 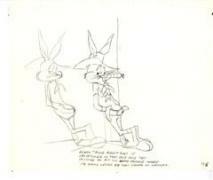 The ears and eyes are located on imaginary lines leading out from the angles of the nose. Bugs is actually a bit cross-eyed, but we never made a point of that. If I am in a generous mood, I allow him three whiskers, in spite of Leon Schlesinger [the original producer of Looney Tunes], who thought we could save money by using only two. Bugs has very heavy cheeks, which cover up a lot of his mouth, and that leaves me very little of the mouth to work with, even though the small visible section of the mouth is vital to an understanding of his character. When he is happy, the inference is that the smile goes way up under the cheeks. When he is sad, the little visible part sags and the cheeks droop. To give him a sardonic look, I draw one side up and the other down. Bugs Bunny was most at home with the challenge of gigantic villains, such as Hassan, the guardian of the cave in Ali Baba Bunny, the muscle-bound Crusher (Bunny Hugged), or Nasty Canasta (Barbary Coast Bunny), his long-time adversary. I never consider the size of characters who are not going to work together. Just for the fun of it, I occasionally put them alongside each other in a line-up, but that has nothing to do with picture making.